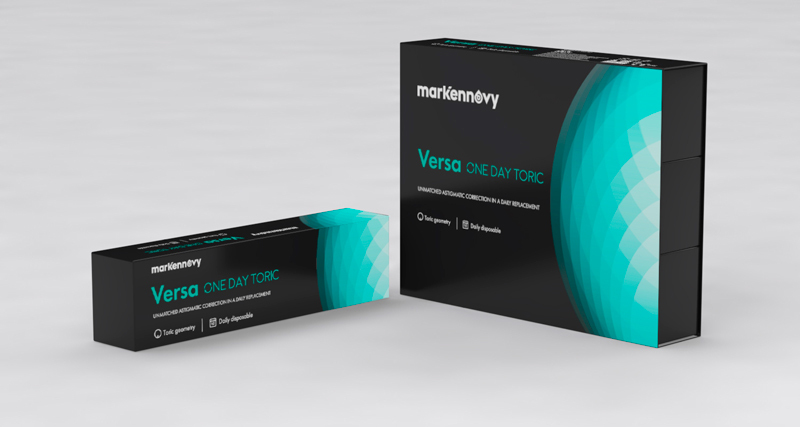 mark’ennovy is pleased to announce the launch of Versa One Day Toric, a made-to-order daily contact lens that provides the widest range of spheres, cylinders and axes on the market. “From our beginnings, we have catered to the uniqueness of each eye, and differentiated ourselves by providing eye care professionals with quality contact lenses that meet each patients’ individual needs,” states George Sarrouf, mark’ennovy’s Chairman and CEO. Versa One Day stays true to mark’ennovy’s precision-based approach to contact lenses whilst establishing the brand’s presence in the fast-growing daily segment. Daily contact lenses are an attractive choice among wearers for their convenience and comfort. However, only a limited number of patients can be fitted with the standard range of options currently available on the market. Therefore, patients who require a higher cylinder or more precise axis are either fitted with a daily lens that is inadequate for their prescription, or they are limited to lenses with a less frequent replacement. 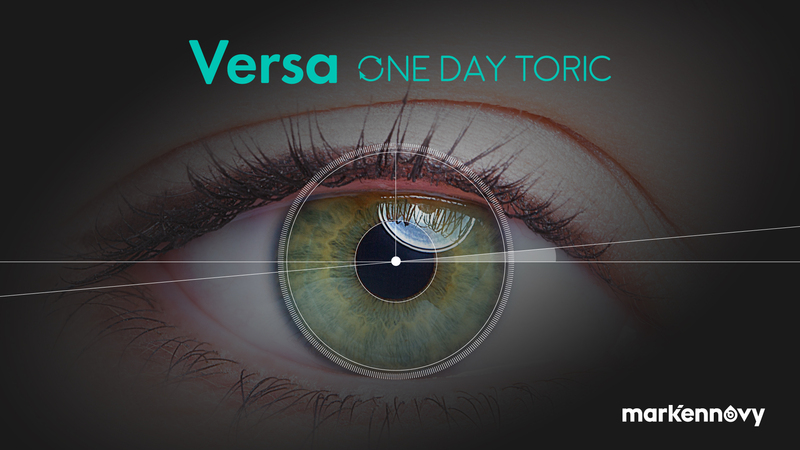 Every Versa One Day lens is made-to-order to give your patients an unmatched astigmatic correction in a daily replacement! Versa is now available for order in 30 and 90 packs. Please contact your Business Account Manager to start fitting Versa One Day Toric today! mark’ennovy is dedicated to innovation and a forward-thinking approach towards the evolution of the contact lens industry. mark’ennovy’s product portfolio is one of the most extensive available on the market in the world with an unrivalled combination of materials, parameters and geometries, catered exclusively to eye care professionals. Hi, I would like to have a trial pack of these lenses would that be possible? Good morning! Thanks for your interest on our new Versa One Day Toric. You can contact our Customer Care team to ask for your trial pack. mark'ennovy is a custom monthly soft contact lens manufacturer. We believe that you should be able to fit the right lens to every prescription, that’s why we start with the eye’s own unique measurements, and then individually craft a lens to match. Our unrivalled combination of contact lens parameters, geometries, materials, and expert technical advice, is backed by world class manufacturing technology and an exclusive focus on the Eye Care Professional.